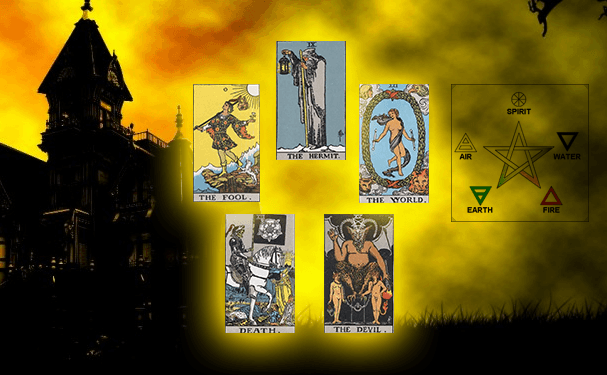 Halloween is a great season, and a perfect time to do a Tarot reading. I love this time of year, the colours change and we all get ready to settle down for winter. With so much time spent indoors, it’s good to think about the future and how the next year is going to plan out. It’s good to give yourself some time before January the first rolls around to plan and think about what you want from your next year here. For now, lets focus on Halloween and a spooky scary Halloween spread! Spirit: Something to aim for, goals and achievements. The journey to take to become what you want to be. Your ideal life. Fire: Instinct. How to treat your current problem. What you want to do regardless of outcome. Earth: Something or someone keeping you grounded. A dependency you may not realise. Something holding you back. Air: Hidden secrets. Something or someone that may be here now but not for long. Water: An action to take to improve your life. Someone who will benefit you. Someone you can help. Be sure to check out the card meanings for insight. Why not comment below or on our Facebook page with your results?